When the local Andalusian government in Spain decided to do away with Windows and the pseudo-interactive, rote-teaching software it ran and kit out all school computers with Guadalinex Edu (an Ubuntu-based Linux distro geared toward education), I was drafted as a teacher trainer to show school staff how to use some of their new tools. My area of expertise at the time was Squeak, the Smalltalk implementation that came with Etoys, an educational layer atop Squeak that let students create scripts by dropping Lego-like blocks onto a workspace and snapping them together. If this sounds familiar, that's because Squeak was further developed into Scratch, the educational programming language that comes preinstalled in most Raspberry Pi operating systems. As usual, I saw a certain amount of resistance among the teachers who were being forced to move beyond their comfort zone. One of them in particular was taking it especially badly and at one point exploded: "What am I expected to do now, learn how to program?!??!" On the inside I was unsympathetic, interpreting her attitude as "You want me to learn something that might make me a better teacher and help my students? How dare you!" However, I assured her that was not the aim of the course. Instead, it shifted material creation from teachers to students; hence, it was the students who were expected to learn how to program, not the teachers. Squeak belongs to the realm of tools created to make student-centered education a reality. As such, these tools are meant to stimulate guided discovery. The teacher introduces the tools to the students and, at some stages, helps out if they get stuck, but for the most part, students should discover how to carry out tasks using the tools by themselves. Often, some students will end up knowing more about the tools than the teacher, and that's just fine in any student-centered classroom. This approach flies in the face of what most information technology (IT) teachers and current national curriculums say should be taught. IT courses in schools concentrate on teaching tools for tools sake and the teacher's role is that of the dispenser of TRUTH. Teachers don't teach how to write, they teach the different options on Word menus; they don't teach accounting, they teach Excel functions. The problem with this approach is twofold: First, it is not generative. As soon as students move to a different environment with different options, or the same options in a different place, or encounter a different paradigm (e.g., move from Windows to Linux or MS Office to LibreOffice), they hit a brick wall. Second, most of the functions of most applications are meaningless if they are not learned within the context for which they were designed. With a bottom-up, learn-about-tools approach, students become button pushers instead of resourceful computer users and problem solvers (see the "Problem Solvers" box). The aim of tools like Squeak and Scratch is not really to have students "learn" them. These tools are a means to an end. As an example: You're teaching the water cycle to 11-year-olds in you science class. You could have students use Squeak, Scratch, or something else to create an animated presentation, complete with flowing rivers, evaporation rising from the ocean, drifting clouds, and falling rain. The project could be developed during science class time or, even better, the science teacher could work with the IT teacher so that both subjects achieve more meaning. How students go about developing their project, once having been introduced to the tools and having worked on some sample projects, is completely up to them. You can offer advice or remind them about the means they have at their disposal, but how things evolve from there is open-ended, and the students should be in control. The focus for the teacher, therefore, should be top-down – that is, setting the tasks and then letting students complete them with the Pi and its software and any other means the students deem necessary. To achieve this successfully, teachers on one hand need a working knowledge of the tools available so they know what is possible. As mentioned before, the teacher doesn't necessarily have to know everything about the tools, just enough to know how to start to solve the tasks set. On the other hand, the teacher also has to know the students well enough to choose tasks relevant to their lives and at the right level so that the projects will be challenging enough to engage the pupils. The Raspberry Pi was designed precisely to be this sort of teaching and learning tool. The hardware is cheap and durable enough to be entrusted to students and small enough to be moved out of the computer lab. Additionally, the operating system and applications are generic and flexible enough to allow students to do whatever they want with them, as long as they solve their tasks. Be warned that what follows is a loooong install, and the suite will eat up about 500MB on your SD card. Figure 1: The Sugar start screen shows a ring" that allows students access the different activities and tools. from the command line (also see the "Sugar on Pidora" box). You can also run Sugar on Pidora, the version of the Fedora Linux distribution for the Raspberry Pi. Pidora is a natural choice for Sugar because Fedora is the distro used for the default Sugar implementation. to install all the necessary software. If you now log out from Xfce, you can pick Sugar from the drop-down menu below the password text box in the login screen. The Sugar environment supplied by Pidora is more up to date and has more functionality than the one supplied with Raspbian. For example, the Neighborhood, which allows students to communicate and share with other Sugar users on networks nearby, works out of the box. The downside is that Pidora still runs very slowly, and it is frustrating to click on an option and wait 10 seconds or more for it to register on the screen. This is not advisable for kids with short attention spans and little patience (i.e., all of them). 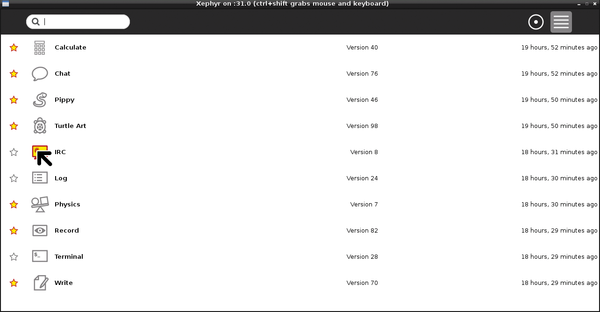 Hopefully, future versions of Pidora will be better optimized and Sugar will work more smoothly. If you would prefer to run a standalone Sugar platform (this will make it snappier), log out from LXDE, type your username in the login text box (default is pi), and click and hold the left button on your mouse on the drop-down list that says Default Xsession to bring up a list of possible desktops. Still holding your left button, move your pointer down to Sugar and let go. Next, click the Log-in button, input your password (the default is raspberry), and click the Log-in button again to start the Sugar educational environment for you. The Sugar "desktop" really isn't a desktop at all. The designers and educators in charge of developing the environment couldn't come up with any solid reason for implementing the traditional desktop metaphor for the classroom, so they scrapped it altogether and went with an activity-geared environment instead. In Sugar, you can only open one "activity" (application) at a time, and all your work is saved in the Journal, accessible through the notebook icon. 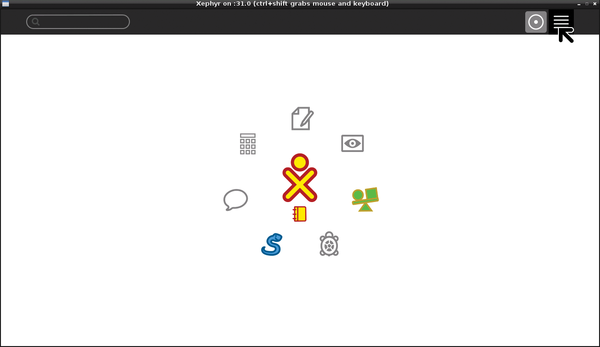 The activities are represented by the icons displayed around the circle and X that identifies the student in the center of the window. You can browse a list of extra activities by clicking the menu icon in the top right of the screen (Figure 2) and add new activities to the ring by clicking on the stars to the right of each item. Choose, for example, the Physics activity and then click on the circle with a dot in the center at the top right of the screen to return to the ring and see how this works. Figure 2: The list view allows you to choose from all the activities installed. As a side note, you can install more activities from the Sugar Labs website , but what you have installed is fine for the moment.